Most of the car buyers in India opt for budget cars under Rs. 10 lakh. Despite the tight budget, car manufacturers have to live up to the expectations as well as deliver as per the preferences of the Indian Customer. And almost all of them boasts of great performance, budget maintenance and standard safety in their segments. Here is a list of top 10 cars under 10 lakhs with an overview of their unique features and performance. The Ford EcoSport in addition to offering first-in-segment features across its variants also boasts of the largest touchscreen in the list of top 10 cars under 10 lakhs. The Figo offers 6 airbags as standard and an appealing panoramic sunroof. The reworked Ecosport launched during the fag end of 2017, with the addition of 8-inch touchscreen infotainment system, has increased the competition in the sub-4m SUV space. The 8-inch touchscreen infotainment system was earlier available only with Tucson, Elantra, and Octavia, which are priced above Rs. 10 lakh in the country. The Ford SYNC 3 unit comes equipped with CarPlay and Android Auto in relation to settings such as ambient lighting function. Further, the Ecosport is available in standard as well. Although, the lower variant has a modest 6.5-inch touchscreen. Following the American Manufacturer on the list of best car to buy under 10 lakhs is its German rival Volkswagen. VW Ameo is the most reasonable diesel car which comes with the dual-clutch automatic transmission. This Sedan with turbocharged Polo GT TSI petrol engine coupled with a 7-speed DSG. The diesel variant is powered by a1.5-liter engine churning out peak power of 110PS and a peak torque of 250 Nm. The mid-variant of VW Ameo, Comfortline has priced at Rs. 9.18 lakh. The last of three podiums in the list of best cars below 10 lakhs is occupied by another Ford offering ‘FIGO’. And being the most economical car with safety electronic stability programme, traction control, and six airbags, it rightfully deserves all the glory points that come its way. The six airbags are available as an option with range-topping Titanium+ variant. Ford boasts of the producer of an with an Indian lineup with six airbags options. On the 1.5-liter petrol automatic variant, the features on offer include traction control (TC), Electronic stability programme (ESP) and a dual-clutch automatic transmission. Other budget offerings from the maker include The petrol Titanium with six airbags and 1.5-liter petrol with 6-speed dual-clutch auto with a price tag of priced Rs. Rs 6.69 lakh and Rs 8 lakh respectively. For those looking for a drive experience matched by none, Honda Jazz is the best option to go for in our list. Equipped with CVT and paddle shifters, the petrol engine V variant comes with a price tag of Rs 8.46 lakh whereas as the Honda Jazz VX petrol, non-CVT variant, is priced at Rs 7.89 lakh. The minimal gap between petrol and diesel prices as well as the magic seats and greater luggage space of Honda Jazz CVT is an ideal option for those for those seeking performance powered by smoothness. The smooth handling also makes it a go-to option among best car under 10 lakhs for performance lovers. However, the 2nd generation models are available as standard and the magic seats are only available in India with top-spec VX version in the country. Like every Hyundai car, the Grand i10 comes loaded with features. The 2017 facelift introduced a 7-inch touch infotainment system in the Grand i10. The capacitive touch-based unit supports Apple CarPlay and Android Auto. Furthermore, ABS, passenger Airbags, Crash Sensor, Side Impact Beams and a host of other safety features along with tested fuel efficiency makes the Grand i10 the first choice in the budget segment for Indian families. It rightfully creeps in to occupy the fifth spot on our list of best car to buy under 10 lakhs. Peppy features make Ignis an attractive buy in our list of top 10 cars under 10 lakhs. Besides the budget price-tag of Rs. 6.50 lakh for the manual Alpha variant coupled with the fuel efficiency can make other top 10 cars under 10 lakhs look overpriced. The most economical car in India features LED headlamps whereas super white LED projector units in relation to U-shaped LED daytime running lamps raises the premium quotient of Ignis. 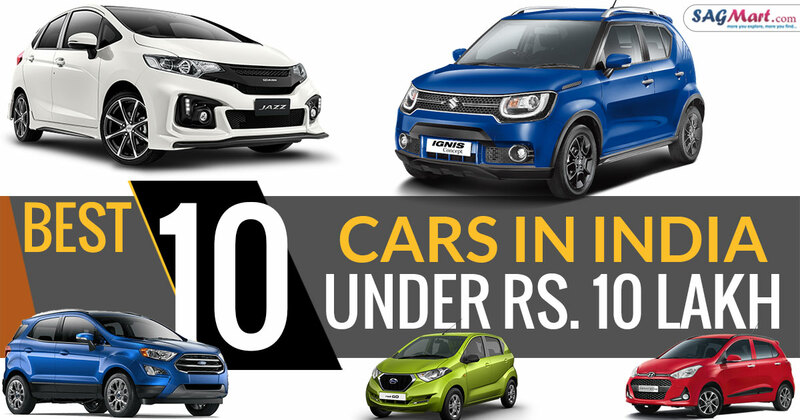 In India, the Swift, the Dzire, and the Ignis are the only available cars under Rs sub-10 lakh price range. Moreover, Ignis is the least priced of all. Tiago and Tigor – the twin dynamites from the TATA Factory offer a great family package on a budget price tag. Some of the highlights that deserve special mention include Harman-powered infotainment unit and the 8 speaker sound system. Tata it seems has offered all it had its kitty for the Tiago and Tigor. The budget offerings deliver magnificently on the design and feature fronts. And value for money is the precise reason why the two offerings together register the 7th spot in best cars below 10 lakh segment. The Kwid is not the best car best car under 10 lakhs but it is also not the worst. With three powertrain options including 1.0-liter petrol engine with both AMT (automated manual transmission) and manual transmission and 0.8-liter petrol engine with manual transmission. The AMT of the car is based on manual transmission only and becomes effective when putting in D mode only. The shifting mechanism is regulated by a dash-mounted rotary knob of the Kwid. The Kwid features a large 7-inch touchscreen and saves some space between the front seats as well. The penultimate position in our list of cars under 10 lakhs goes to Datsun Redi-GO. Although a long way away from the top performers but with a price tag of Rs. 3.54 lakh, one can’t ask anything more than what’s on offer. The cosmetics on the range-topping S variants are world class and feature list include premium offerings like running LEDs available, bright DRLs that mostly adorn top-end variants. This is a good enough reason for Datsun Redi-GO for appearing to our list. Last but not least, the Tata Nano despite its sluggish sales manages to make it to our list. In addition to the price-tag, the availability of a sunroof variant at a nominal cost of just Rs. 6,500 above the price are reasons strong enough for us to give it the 10th spot for top 10 cars under 10 lakhs. The Automatic Nano is the cheapest among affordable cars under 10 lakhs. The top-of-the-line budget XTA features four-speaker setup, Bluetooth-enabled music system, instantaneous fuel consumption, keyless entry, gear shift indicator, and average fuel economy.